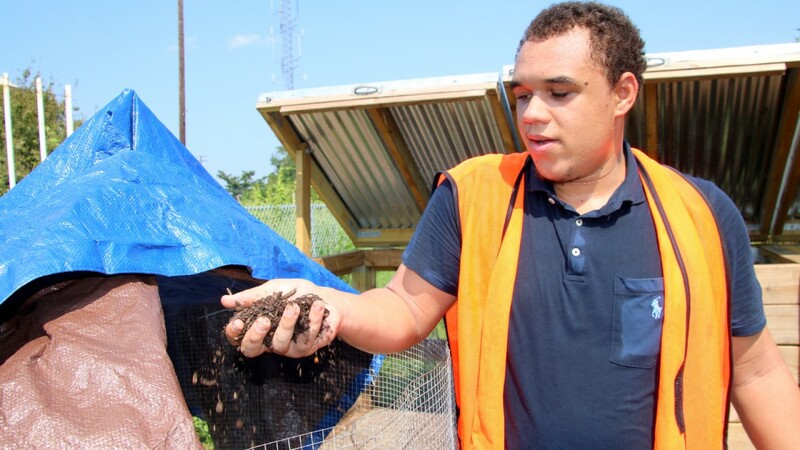 “They call this black gold,” Walton said, holding up a handful of rich brown gardening compost, the usable product those food scraps are destined to become. 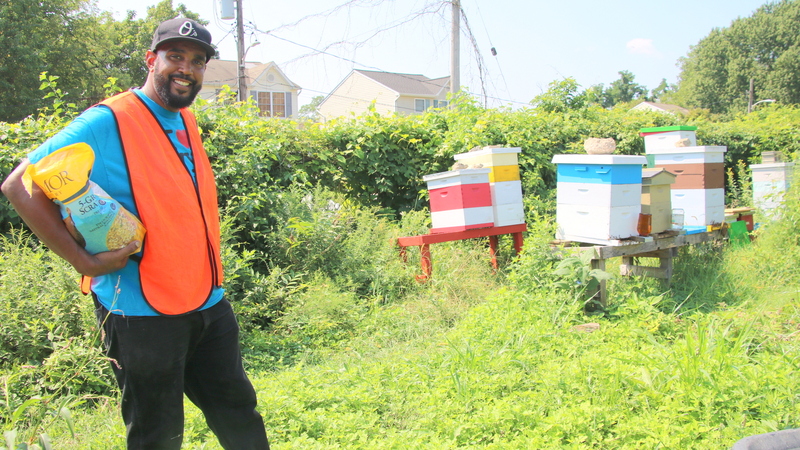 Walton, who grew up in this hardscrabble southside neighborhood, works for the Baltimore Compost Collective, a year-old food scrap collection service that employs local youth to pick up the food waste from residential customers and turn it into compost. 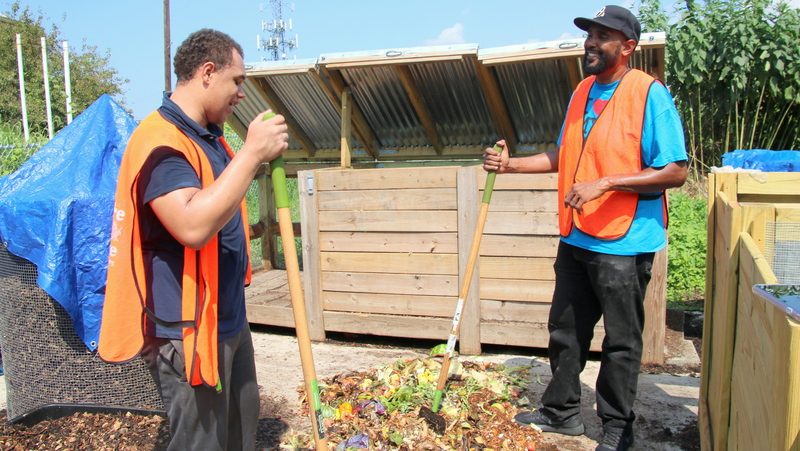 “Tell ’em what composting means to you, Anthony,” program manager Marvin Hayes said, as he sliced and diced alongside his young assistant. Hayes, a longtime youth mentor from the Sandtown-Winchester neighborhood, met Walton when he was 14 and participating in an earlier program that Hayes ran. The boy left Baltimore to live with relatives in California, and when he returned, he reconnected with Hayes who worked to steer him away from the streets and potential trouble. The project is located in, and provides compost for, the Filbert Street Community Garden, a verdant plot that generates produce for the neighborhood and educational programming for area schoolchildren. 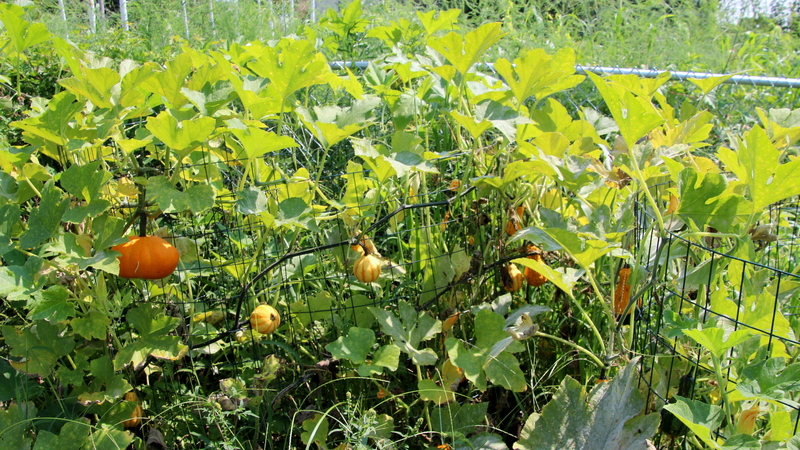 Visitors can see the red tomatoes, green squash and orange pumpkins growing on vines intertwined with rampant white morning glories. They can dodge the bees in the apiary. 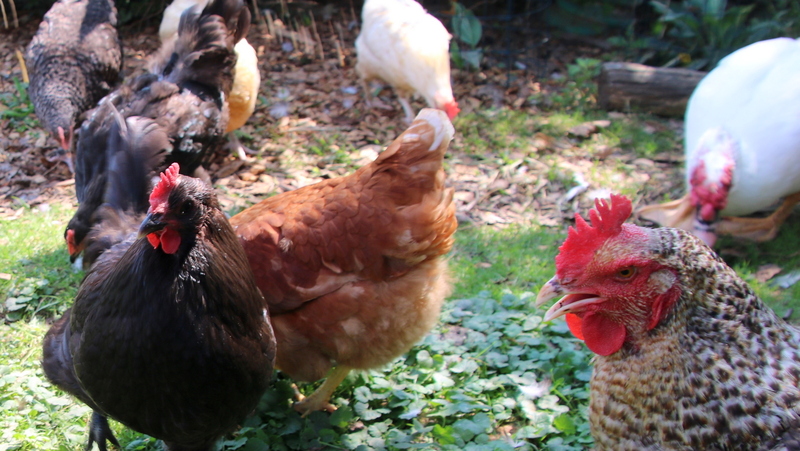 Or feed Filbert, the boss rooster of this one-acre kingdom, that includes a menagerie of other chickens and ducks, as well as volunteers and neighborhood gardeners. They can also learn about the work of the Compost Collective. It currently has the capacity to produce about 800 pounds of compost. Hayes, Anthony and another youth participant, Rayjion Hall, collect the material from 28 residential customers and one commercial customer, Pure Raw Juice, a Federal Hill juice bar. So far, two of the five young men who have worked in the program have gone on to full-time employment. “We not only rescue food, we rescue young people,” Hayes said. It’s kind of his catchphrase, which he repeats with infectious verve. Launched a year ago with funding from the Abell Foundation and the Robert F. Schumann Foundation, the Collective is a project of the Institute for Local Self Reliance, United Workers and the Filbert Street Garden. It serves Curtis Bay, Locust Point, Riverside and Federal Hill, charging residential customers $25-per-month for a bucket to be picked up weekly. They currently don’t have the capacity to accept any other commercial customers, but hope to keep expanding in the future, Hayes said. “Shout out to Pure Raw Juice for raising $1,500 to towards the building of these three new bins,” he said, asking Walton to explain the process. The mixture cures in the bins for a couple of months and then, after being sifted through a screen, the fine crumbly product is ready. 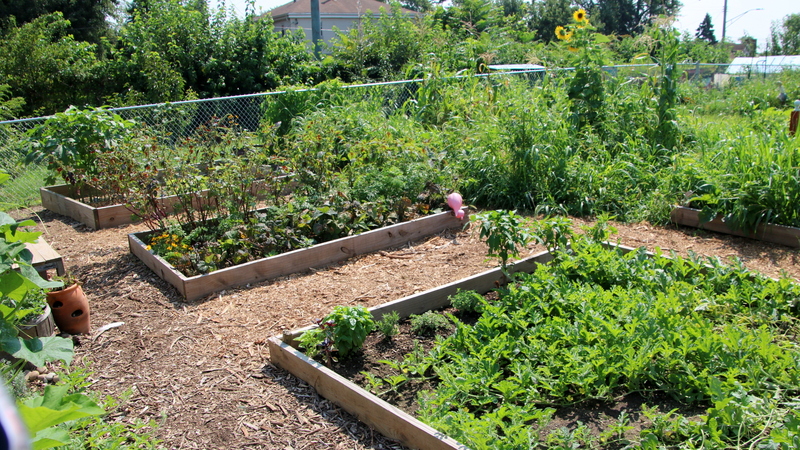 Walton said he’s glad to help the garden provide vegetables, eggs and honey for the community. Hayes and the others involved in the Compost Collective are not the only ones in Baltimore with dreams of scaling up composting. The Planning Department’s Office of Sustainability last week announced that Baltimore was selected for a food waste management partnership with the Natural Resources Defense Council that includes a $200,000 grant from the Rockefeller Foundation. The grant will support a full-time person for two years dedicated to leading a three-pronged effort. The initiative will encourage people not to waste food through an ad campaign. Estimates are that as much as 40% of the U.S. food supply goes uneaten every year. Another priority will be to promote food recovery by restaurants and other businesses. The goal would be to get surplus food to people who need it. And as part of the campaign, the city will work to strengthen and foster pilot composting programs like the one operating out of the Filbert Street Garden. “We’re looking at doing some composting pilots residentially, with businesses, maybe with farmer’s markets,” said sustainability coordinator Anne Draddy at a news conference last week with Mayor Catherine Pugh. Estimates are that as much as 40% of the U.S. food supply goes uneaten every year. “One thing we’d like to do in the two years is site a composting facility somewhere in the city and work with a private partner who will develop that with us and do a public-private partnership,” she added. Draddy was asked if the goal was to get Baltimore to the point where it could provide residents with curbside food waste pick-up, as San Francisco, New York City, Portland, Maine and other cities do. – Baltimore Brew has received grant funding from the Abell Foundation.